Particle board and MDF, or medium density fiberboard, are regularly used in furniture and household construction because of the advantages when it comes to uniformity, density, and especially price. But what are the particular differences between the two, and if you were forced to choose between fiberboard vs particle board, which would you choose and why? Used since the 60s, particle board is made from a hot pressed composite of waste wood products, that are held together using formaldehyde resin. Regularly used in multiple applications, including countertops, cabinets, doors, floors, paneling, and furniture, particle board is inexpensive but relatively weak. Generally, particle board is covered with a laminate or veneer to improve its appearance. The primary reason for the particle board’s ubiquity is the price. It’s the cheapest option available that can still provide a good finish, especially once it has been painted or veneered. 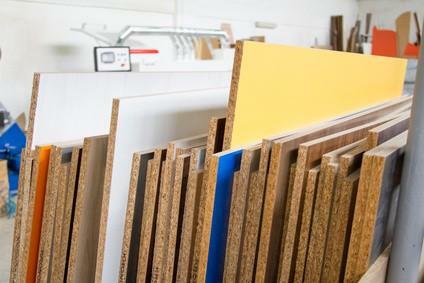 Particle boards are also lightweight, which is why they’re primarily used for ready made and home assembly furniture. The downsides, apart from the already mentioned structural weakness, is the fact that particle board tends to expand when exposed to water, meaning it can’t be used outside and has to be specially treated for kitchen and bathroom use. Medium density fiberboard, or MDF, is also a composite product made with formaldehyde resin, wood fibers, and wax. It is much denser than particle board but much cheaper than solid wood, MDF is a regular replacement for plywood, especially when you consider that MDF tends to be very internally consistent and doesn’t split when cut. MDF is also easy to cut and can be shaped and molded by all types of power tools. This makes it far more widely used in situations where more work has to be done with the material. MDF is ideal because it is simple to paint and incredibly smooth, especially in areas where solid construction and a good standard of general finish are necessary. Because of the similar construction, MDF also expands when exposed to moisture, which can lead to cracking or breaking. MDF is also incredibly heavy, and unsuitable as a finishing material, requiring another type of wood to be used to trim out anything that requires it. Both MDF and particle boards are made using toxic chemicals, primarily formaldehyde. Because of this, neither are environmentally friendly and sanding or cutting it can cause health problems if the resultant dust is breathed in. If this is a concern, some MDF manufacturers are moving away from formaldehyde based resins and are using polyurethane instead. Is MDF stronger than plywood, and which should you choose? This is a very difficult question because there are so many different grades of ply available. In general though, no. Plywood is incredibly strong, because of its layered construction. However, there are advantages and disadvantages to both. As an example, plywood tends to splinter when cut, and it’s far harder to shape and work on. So, in areas where delicate or particularly decorative work is necessary, MDF might be a better choice. Conversely, plywood holds screws incredibly well, whereas MDF tends to strip screw holes very easily and they come out of MDF much easier. Is particle board stronger than plywood? If you’re looking at MDF vs particle board, then you’re essentially considering two varieties of the same product. Particle boards are the cheaper, weaker option, with MDF being far denser and therefore stronger, but commensurately more expensive. As an example, when testing load strength on shelving to carry a weight of 50lbs per square foot, particle boards can only hold a maximum of 13 inches in length, where MDF can hold up to 15 inches. Both particle boards and fiberboard can generally be used in the same situation and are widely used in areas as varied as paneling, furniture, and flooring. However, as a higher quality material with a flatter, denser finish, fiberboard is better suited for musical instruments and speaker components, as well as children’s furniture and toys. In terms of strength and general quality, MDF beats out particle board in almost every category. However, because it is so much cheaper, as well as far lighter, particle board has its place in a lot of projects and builds and it definitely shouldn’t be looked over. Whilst each type of wood can always be used for multiple applications, it generally comes down to the project. When making a choice over fiberboard vs particle board. Standard considerations apply to the nature of your build, such as whether people are going to see the finished product, and the load bearing requirements it has. Consider everything carefully, and if in doubt, ask someone at your local hardware store about your particular job.